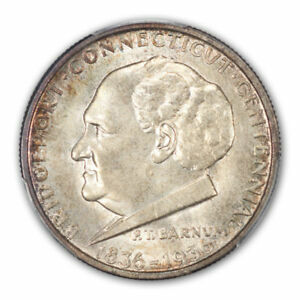 More than one writer has noted the appropriateness of depicting showman P. T. Barnum on a commemorative half dollar. 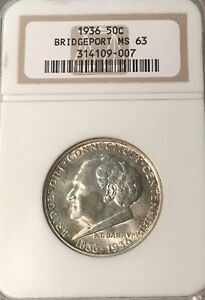 The saying "There's a sucker born every minute" has been attributed to Barnum, and by the time that this issue was released (the fall of 1936), most coin collectors were beginning to feel like suckers for having purchased each of the commemoratives which appeared that year. 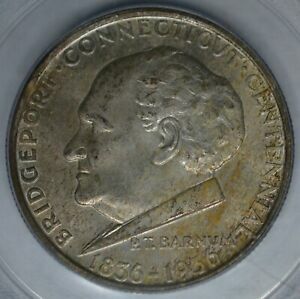 While this coin features Barnum quite prominently, it is not the man but the city of Bridgeport, Connecticut that is being commemorated. The centennial of its incorporation provides the actual anniversary dates. It's ironic that Bridgeport was not incorporated until 1836, since it's one of the oldest communities in New England; it was founded nearly 200 years earlier, in 1639. As its name implies, it is a seaport city, located on the north shore of Long Island Sound. It grew as a fishing village during the 17th and 18th centuries, but the onset of the Industrial Revolution turned it into one of America's most productive manufacturing centers. Since the Civil War, Bridgeport has earned the title "arsenal of democracy" for the vast quantities of military hardware that it furnished. Its other industrial products include electrical appliances, turbine engines, trucks and aerosol sprays. Without a doubt, the most famous resident of Bridgeport was Phineas Taylor Barnum. Not a native of this city, he was actually born in Bethel, Connecticut on July 5, 1810. It was Bridgeport, however, that he ultimately made his home. After leaving school at age 13, young Phineas earned a modest living as a clerk and then a newspaper editor. It was in this latter role that he developed the grand reputation for hyperbole that would define his future endeavors. Barnum's entry into show business began when he purchased an elderly slave woman named Joice Heth who claimed to be 161 years old and to have nursed the infant George Washington. Despite the absurdity of this tale, Barnum exhibited her in several northeastern cities, enjoying enough success in this venture to convince him that his future lay in providing amusement to the public. He expanded his role by purchasing the curiosity museums owned by Peale and Scudder and incorporating their exhibits into his own American Museum in New York. His most famous and profitable showpiece was the diminutive General Tom Thumb, who toured with Barnum from age 5 to age 11 and became an international celebrity welcomed by kings and queens. Another show business triumph was his discovery of "the Swedish Nightingale," Jenny Lind. Imported from the Old World amid fantastic publicity, she was raised from total obscurity to nationwide acclaim through Barnum's clever marketing campaign. In 1871, P. T. Barnum entered another arena when he assembled "The Greatest Show on Earth," a traveling circus complete with exotic animals and human freaks. Successful from the outset, this venture was further expanded when Barnum merged his show with that of James A. Bailey, creating a production of colossal scope and scale. After their deaths, Barnum & Bailey's Circus was bought out by the Ringling Brothers. Both shows were then combined in one extravaganza that even today bears all three surnames. 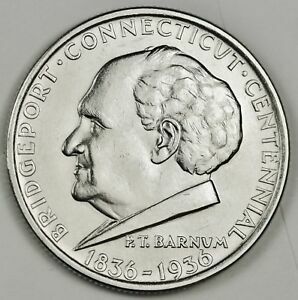 Barnum's genius as a showman is widely acknowledged, but it was his achievements as a public servant and philanthropist that earned him lasting recognition on the Bridgeport half dollar. Phineas was both the mayor of Bridgeport and a member of the state legislature, although his bid for a Congressional seat in 1866 proved unsuccessful. In 1883, the Barnum Museum of Natural History was created at Tufts College in his honor. Among its exhibits is Barnum's giant elephant Jumbo. When P.T. 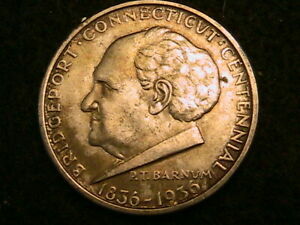 Barnum died April 7, 1891, Bridgeport lost a respected citizen and the nation its greatest showman. 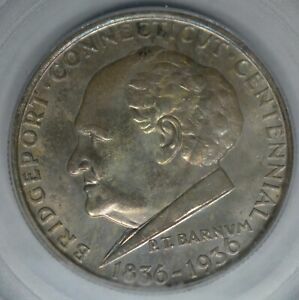 Commemorative coins were all the rage in 1936, as Bridgeport approached the 100th anniversary of its incorporation. 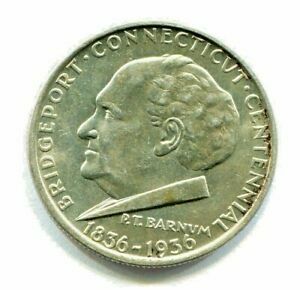 A group of civic leaders, calling themselves the Bridgeport Centennial, Inc., sought to join in this activity by having a half dollar coined to recognize their town. 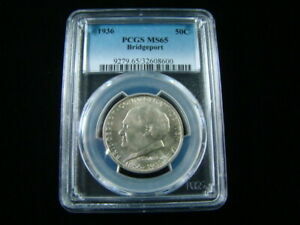 The process must have moved smoothly, as little is recorded about the Bridgeport coin in Congressional records. 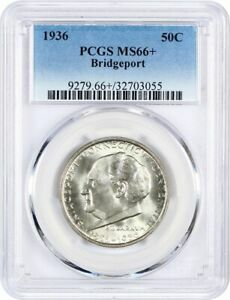 A bill was passed May 15, 1936 which authorized the minting of no fewer than 25,000 Bridgeport half dollars. 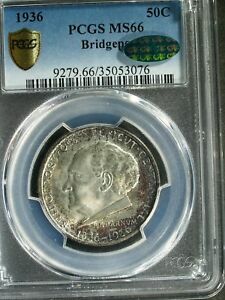 These were to be coined with a single design, at a single mint and with a single date, 1936. It was hoped that these provisions would prevent the abuses associated with some past commemorative programs. 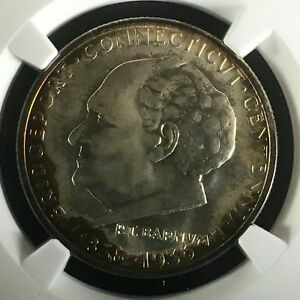 Curiously, however, no maximum coinage was specified, and nothing precluded the minting of 1936-dated halves for decades to come. It was fortunate for collectors that the sponsors of this issue chose not to exploit this oversight. 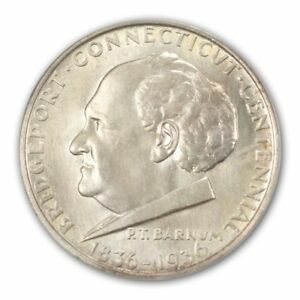 Selected to design the Bridgeport half was sculptor Henry G. Kreiss, veteran of the previous year's Connecticut Tercentenary coin. The Commission of Fine Arts indicated its faith in Kreiss' ability, but sculptor member Lee Lawrie suggested relocating some of the statutory inscriptions so as to not deprive Barnum's portrait of its impact. With other minor changes, the revised sketches were submitted to the Commission on July 10, 1936 and approved one week later. The eagle modeled by Kreiss for the reverse drew some criticism for its extremely stylized and streamlined appearance. This seems a fair evaluation, as it does clash with the very conventional and realistic portrait of Barnum. 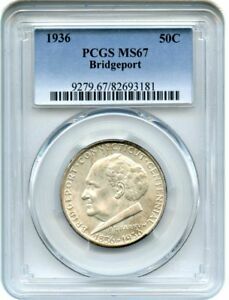 The reduction of Kreiss' models was performed by the Medallic Art Company of New York, a common practice with commemoratives during the 1930s. In September, 25,015 pieces were coined at the Philadelphia Mint, the odd 15 being reserved for assay and later destroyed. 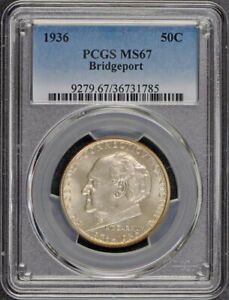 Bridgeport halves were offered at $2 apiece and were distributed through the First National Bank and Trust Co., as well as selected other banks. Purchasers were limited to five coins each. Despite their arriving too late for most of the centennial celebrations, these coins sold well to both the general public and collectors. The majority were sold within a few months, although several thousand remained in 1938. These were wholesaled to dealers at a small premium over face value, and hoards of Bridgeport halves remained intact as late as 1972. 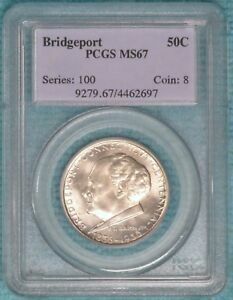 None were ever returned for melting, so the net mintage for this type is 25,000. 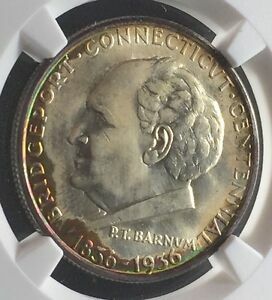 The typical Bridgeport possesses slightly dull but satiny luster and shows a number of contact marks on the exposed relief of Barnum's face and the eagle's wing. 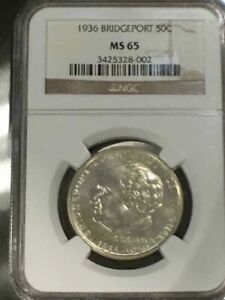 Some coins will have more attractive, semi-prooflike or flashy, satin luster. Metal-flow lines from worn dies are not unusual. 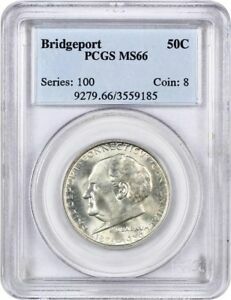 Most coins grade MS-60 through MS-64. MS-65 gems are not rare, but this issue is elusive in higher grades. A number of pieces were mishandled by the general public, and these may show signs of wear, harsh cleaning or unattractive toning. The first points to reveal wear are Barnum's cheek and the eagle's wing. 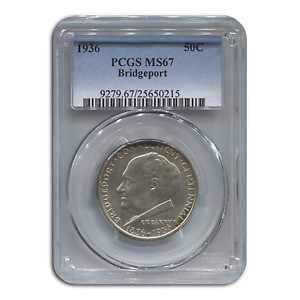 Bridgeport halves were originally distributed in a distinctive cardboard box which is itself collectable. Dark blue, with gold lettering and graphics, it displays on its outside the city seal and two diagonal bands. On the inside of the lid is a short biography of P. T. Barnum. 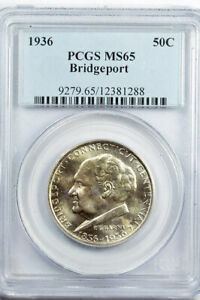 No proofs are known of the Bridgeport half, but it's possible that the Mint's Chief Engraver John R. Sinnock may have had a few matte proof examples coined. 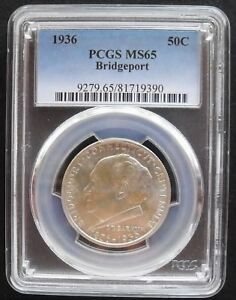 1936 BRIDGEPORT 50 CENTS PCGS MS 65 GEM SILVER COIN .